According to a recent Agriculture.com article, wet weather conditions across the nation’s midsection is affecting both soybean planting and this season’s insect activity. The USDA Crop Progress Report indicates 40% of Illinois soybean acres have been planted to-date and the National Agricultural Statistics Service reports roughly 12% of the soybean crop has emerged across the state. However, Mike Gray, professor of entomology at the University of Illinois, says storms across the Midwest are causing planting delays, which could make the crops first to emerge more susceptible to early-season feeding from overwintering bean leaf beetles. 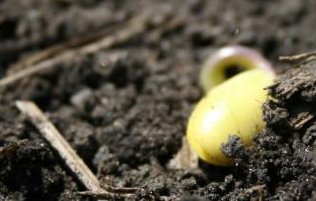 “As soybean plants become available in May and June, they become a preferred host [for overwintering adults]. Fields most at risk this spring would include those that were planted first within an area and are now serving as a very attractive trap crop,” reported Gray. Gray claims continuing delays in soybean planting could, on the other hand, dim the prospects for soybean aphid establishment this season. “These spring migrants may have more challenges this year locating soybean fields that are ready to receive them,” he says. While Gray reports it’s still too early to offer any kind of firm predictions for soybean aphids this year, he says fields at risk of bean leaf beetle infestations should be scouted for signs of defoliation. A rescue treatment seeding soybeans is most often not needed because “densities of 16 beetles per foot of row (early seedling stage) or 39 adults per foot of row at the V2+ stage of development are necessary for economic injury,” he adds.